Persistence Market Research has recently published a research report on the global automotive bearing market. The report offers a comprehensive evaluation of the market. It does so via in-depth qualitative insights, historical data, and verifiable projections about market size. The projections featured in the report have been derived using proven research methodologies and assumptions. By doing so, the research report serves as a repository of analysis and information for every facet of the market, including but not limited to: Regional markets, technology, types, and applications. 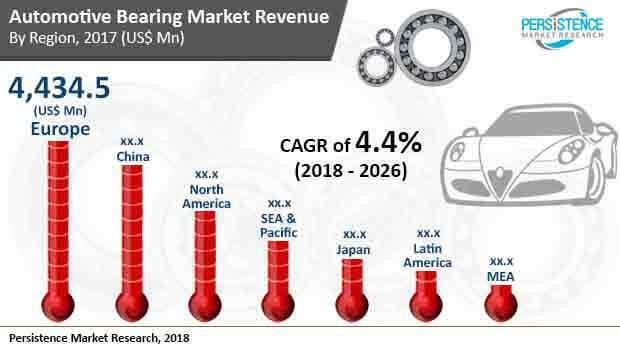 The US$ 18.47 Bn global automotive bearing market is apprehended to experience moderate growth over 2018-2026 at a CAGR of 4.4% and attain a value worth US$ 27.02 Bn by the end of an eight-year forecast period. In addition to flourishing automotive industry worldwide, it has been observed that increasing average vehicular age will prominently fuel the demand for repairing, maintenance, and replacement of automotive components – in turn fostering the sales of automotive bearings. Surging fleet is rapidly putting forth the aftermarket demand for automotive bearings, which is identified to be another key driver to market growth. Despite the overall decline in the number of bearings in the novel electric vehicles, product innovations are expected to continue generating demand for bearings in near future. Moreover, the market is currently experiencing polarisation towards the most preeminent players in the competitive landscape, which is also anticipated to boost the market growth over 2018-2026. As per the regional analysis in the report on the global automotive bearing market, Europe is currently the global leader, followed by China. Europe, the largest regional segment with nearly 24% share by value, is likely to face a slight decline by 2026 end, losing its market share to China. China, which is currently the second largest market in terms of revenue, is foreseen to witness strong growth over the next few years, gaining a significant market value share to become the largest regional market for automotive bearing by 2026 end. China is also identified to be the fastest growing market at an estimated CAGR of 5.2% over 2018-2026, capturing a value share of over 24%. Led by the US, North America currently holds more than 18% share of the total market revenue and will reportedly witness steady growth throughout the forecast period, maintaining a market value share of around 19% by 2026 end. US accounts for more than 82% share of North America's total revenues, attributed to sustained demand for applications in automotive transmission system. Europe and North America are projected to witness moderate growth at CAGRs of above 4%. While Brazil is foreseen to create a significantly important market in Latin America, the entire South East Asia & Pacific (SEAP) region is presumed to be the most opportunistic market for automotive bearings in near future, in terms of demand. SEAP is slated for promising growth during the forecast period at a CAGR of 4.8% and a market value share of above 15%. Growth of SEAP is attributed to the possibility of multiple attractive opportunities that the region is likely to present to established as well as emerging players in upcoming years. The global market for automotive bearings peculiarly has presence of a limited number of key industry players based in Europe and Japan. The global market for automotive bearings is divided on the basis of product type, vehicle type, application, and sales distribution channel. By product type, roller bearings will continue to roll to the top compared to other types of bearings, including ball bearings and plain bearings. Based on vehicle type, passenger vehicles (PV) will remain the largest consumer of automotive bearings in near future, among all vehicle types, such as commercial vehicles (CV) and two wheelers. On the basis of application, transmission system will remain the largest revenue generating segment, followed by wheel hub, steering system, and engine. According to sales channel, original equipment manufacturers (OEMs) will continue to be the largest segment, followed by independent aftermarket (IAM) and original equipment supplier (OES).